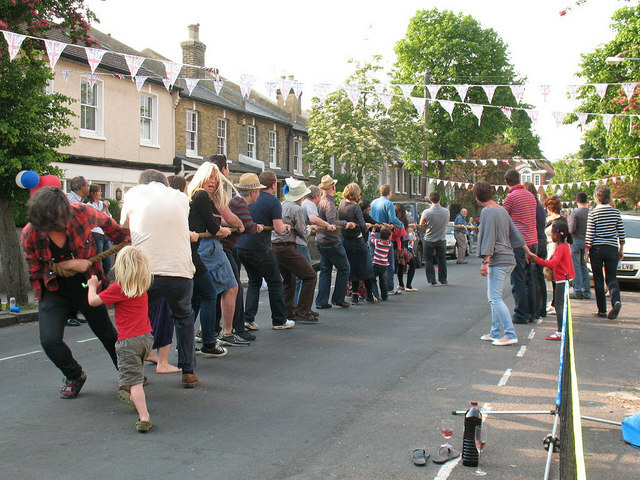 Celebrations included a friendly tug-of-war between residents of neighbouring streets. The 'home team' won. A street party was organised by residents of Couthurst Road, Blackheath on the afternoon of Friday 29 April 2011, a public holiday for the wedding of the Duke and Duchess of Cambridge (Prince William and Catherine Middleton). It was attended by present and former residents of the street, residents of nearby streets, the Vicar of the parish (St John's, Blackheath) and a few overseas visitors. The wedding of Prince William and Catherine Middleton took place on 29th April 2011, the day was made a bank holiday, and many pubs and businesses celebrated, and street parties were held across the UK.